An Adelaide chocolatier has released a new organic, small-batch, single-origin chocolate range – made from scratch from raw cacao beans – just in time for Easter. Chantelle Giardina has a chocolate-making pedigree of sorts. Trained as a pastry chef , she has been working as a chocolatier for Steven ter Horst for six years. “I learnt the basics of chocolate making from Steven, but I wanted to branch out and start making chocolate from scratch rather than from already-processed Callebaut or Valrhona pellets,” explains Giardina. Giardina began “playing around” with raw unprocessed cacao beans sourced from organic and fair-trade South American farms through a US dealer, reading as much as she could online and learning through trial and error. “I also consulted with a food scientist in the US who used to work for Mars and Nestle and now works as a consultant to cacao farms, advising on the processes [from harvesting the pods to the drying and fermentation of the beans] to produce the best flavours. 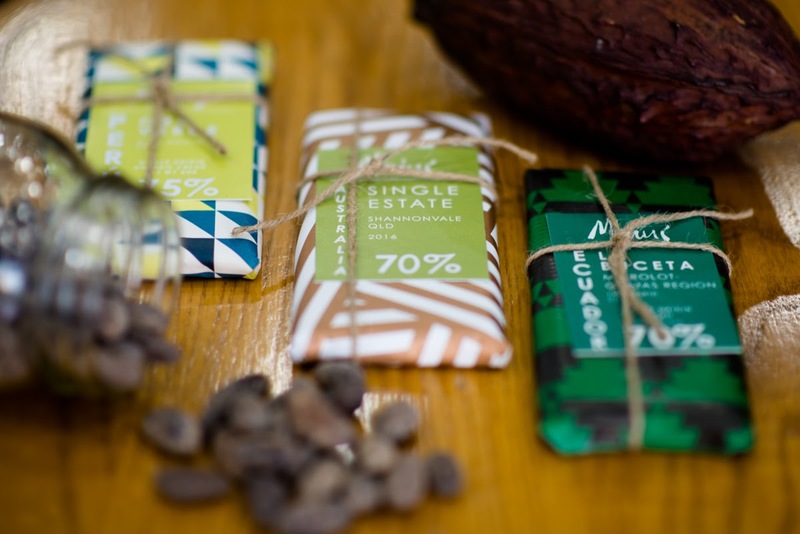 Maius Chocolate – the result of Giardina’s acquired bean-to-bar chocolate-making skills – launched at the recent Cellar Door Fest food and wine festival with four varieties of small-batch, organic, single-origin, fair-trade and fully traceable chocolate bars. Peru is a 75 per cent cacao bar made from beans sourced from Ordos Verde Co-op producers in the Lamas region of Peru; Ecuador is a 70 per cent cacao bar made from beans sourced from the La Buceta Microlot-Guayas region; Bolivian is an 80 per cent cacao bar made from wild harvested beans from Bolivia; and Australian is a 70 per cent cacao single-estate bar made from beans grown in Shannonvale, near the Daintree National Park in northern Queensland. All Giardina’s bars weigh in at 80 grams and sell at $14 each. The texture of her chocolate is exceptionally smooth and the flavours rich and intense, with very little bitterness. At the Cellar Door Fest, she sold out of the Bolivian. Giardina still makes chocolate for ter Horst and she currently makes her Maius Chocolate in his commercial kitchen. She buys in 60kg bags of fully traceable cacao beans. The chocolate-making process begins with careful hand sorting of the beans “to make sure there are no sticks or rocks among them”. The beans are then roasted in a commercial oven and cracked open to release crunchy and flavourful nibs. “I stone-grind the nibs with sugar for two to three days to refine the particles and create a smooth texture and the right tannin and acidity levels. Tempering is the process by which chocolate is heated and cooled to create the desired texture and finish. “Proper tempering helps the chocolate to set perfectly – the finished product should have a good snap. Giardina is about to release a dark malt and barley bar made with milk chocolate – “it tastes like a Malteser but the flavour is more intricate and not as sweet”. In the meantime, Maius Chocolate is available from Steven ter Horst‘s Rundle Street store and online.